Cork-Rubber is the most frequently used material. FEL-PRO Blue Stripe premium-quality cork-rubber gaskets use evenly-sized cork particles evenly distributed throughout a rubber binder. The result is a compressible gasket without leak paths. Fel-CoPrene synthetic rubber can offer longer life than cork-rubber. However, because it is more flexible than cork-rubber, it can be more difficult to install. Generally, a quick-drying contact adhesive should be used to bond the gasket to the valve cover before installation. Rubber-Coated Fiber is used for some high heat applications, such as Chrysler big block V8 engines, where the valve cover is in close proximity to the exhaust manifold. These Fel-Pro gaskets are made of a stiff, high temperature fiber material coated with latex rubber. Cork-Lam is used in applications where high vacuum or blowout conditions can be a problem. Cork-Lam uses a metal core with cork-rubber material chemically bonded to it on both sides. 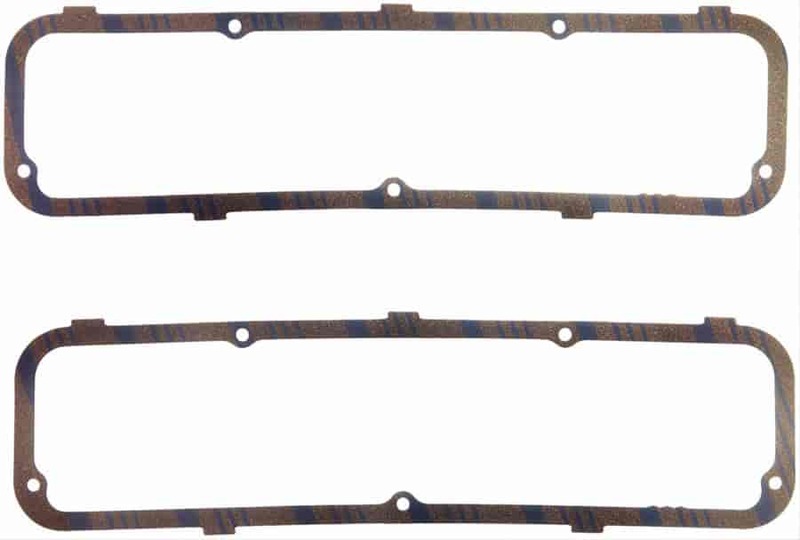 This construction allows for a thicker than normal gasket with exceptionally good torque retention and also allows for more clearance between the valve cover and valvetrain. Composite Material is a superb choice for Pro-Stock, FunnyCar/Dragster, and NASCAR race engines. Laminated over a steel core, the composite material offers maximum compression and torque retention in super-high vacuum conditions. The Fel-Pro gasket is also coated with silicone for even greater sealability and easier removal. Molded Silicone Rubber gaskets provide for ease of installation and are great for on again/off again situations like valve lash setting. These Fel-Pro gaskets feature high-tech silicone material for long life and sealability, a solid steel core for strength and durability, and stainless steel compression limiters to prevent overtightening. This is an excellent choice for high vacuum race engines. Does Fel-Pro 1632 fit your vehicle?